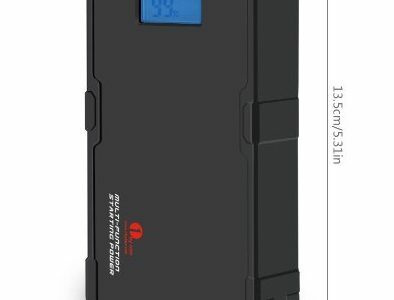 The 1byone 9000mAh Multi-Function Portable Car Jump Starter is a lithium ion powerbank that will jump start a car in seconds and quickly recharge phones and gadgets multiple times. The 1byone comes in a handy case to carry the unit and accessories, and the powerbank itself can be easily popped into a rucksack, or car glove box once it is charged and ready to go. The kit includes the powerbank, jump leads, and the jumplead adaptor. Uniquely, both the adaptor and power bank both have digital readouts. For more information on the manufacturer of this model see our 1byOne page. If our review leaves you with any questions, pop them in the comments box at the foot of the review and we’ll do our best to help you! 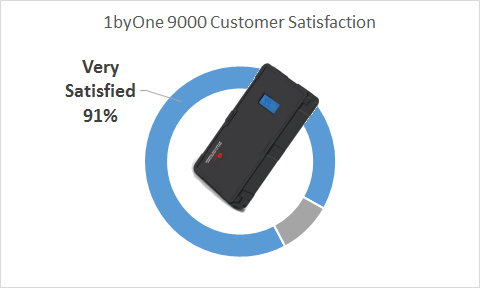 We’ve summarised every customer review published on the web into the following chart so you can see at a glance how the 1byone 9000 is rated by actual verified owners. These reviews were collected from large online retailers and totalled over 1,000 individual reviews. In accordance with our unique customer ratings analysis, our world-wide aggregated customer review score above eliminates irrelevant or invalid reviews , giving you the best independent indication anywhere of true customer satisfaction! Why the 1byOne 9000 is our favorite jump starter. 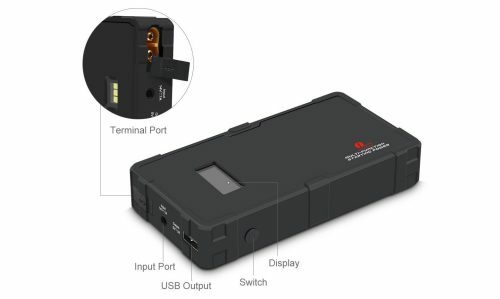 Until the 1byOne came along the new breed of lithium ion powerbank car jump starters all offered pretty much the same benefits compared to bulky full size lead acid jump starters, ie. 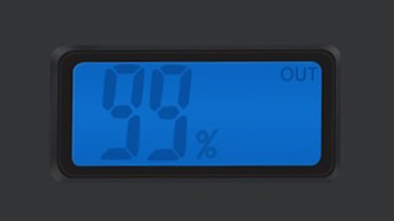 The 1byOne however brings a new feature to the table, digital readouts! These are great for an early warning about when your charger is about to run flat and requires a charge up. There is no reason now to be stranded without a fully charged, ready to go, jump starter. For this reason alone we have propelled this jump starter straight to the top of our lithium ion jump starter league table. That’s not all to like however, as the latest version comes neatly packed into a sturdy case perfect for storing in the rear of any vehicle. I also liked that it came charged and ready for use – so if you have a vehicle parked up somewhere that you really need moving again, you will not have to wait for it to charge – unpack it, connect it to the battery, and you will be driving off in seconds! The 1byOne 9000 has safety features that makes it ideal for beginners, new drivers, or inexperienced home mechanics. 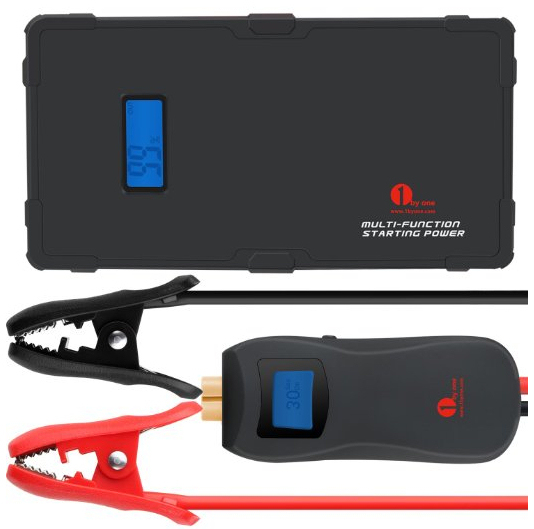 These features together on one device make the the 1byOne 9000 stand out amongst other popular jump starters. More than most, this will crank engines hard! Hard to believe it packs such a punch! About the size of a smart phone! Use with confidence, no damage through careless use – it’s mistake proof! Audible alarm. Check if power is on before applying clamps. Important feature not on all jump starters! Multifunctional! Having a device with you in the that is always ready to charge your phone, tablet or gadget is a real timesaver! Digital Readout. 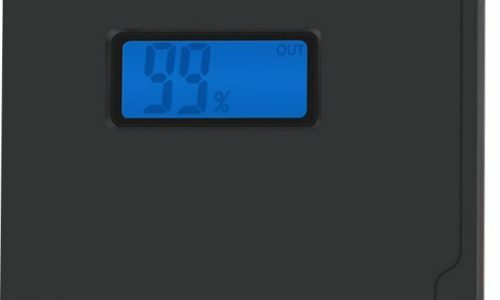 No guessing if the unit is fully charges, or trying to remember how to interpret LED indicators, this unit comes with a clear digital display. Combine these features with a rugged build quality and handy carry case, with 90% consumer satisfaction and you have a winning package that comes highly recommended! 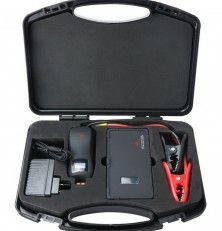 There are no disadvantages with this particular jump starter, it is a fantastic piece of kit! How often should it be recharged? How do I recharge my jump starter? 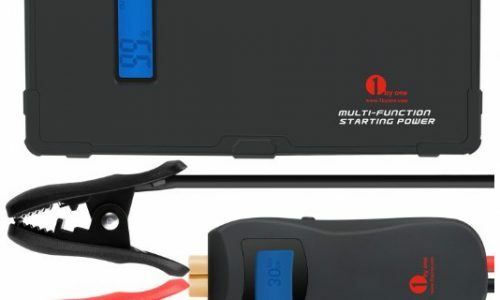 How do I know when my jump starter is fully charged? What happens if I connect my jump starter up backwards/reverse? What is the best way to store this starter? What is error message Err4? How does the LED light operate? Charge the unit to 100% every 3 months. Following this advice from the manufacturer will ensure that the jump starter is ready for use when you most need it. 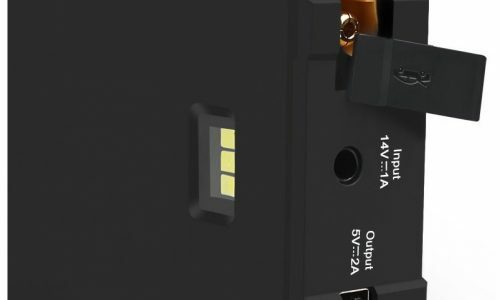 After all, what is the point of having a jump starter if it is not kept in a charged state? Can be charged in vehicle using the lighter socket, or at a wall socket using the included adaptor. As stated in the main body of our review, charge state with this particular model is displayed on a digital readout, very cool. Thanks to clever technology, a safety alarm will sound to warn of incorrect connection, it is therefore very safe to use! As with all lithium ion power banks, this unit should not be stored in direct sunlight. You should only have to recharge the unit twice a year. Err4 means that the device needs charged. Press and hold the black button on the side for a few seconds, and the light should come on. A second press activates the SOS flash. A third push increases the flash rate. Finally, press it one more time to switch the light off. The 1byone 9000 proudly sits in my cars glove box, ready to help any stranger or family member in their moment of need, stranded at the side of the road. I was never really keen to offer my vehicle up to jump start another car; the dangers of trying to pull up bumper to bumper against another vehicle next to live traffic, messing around under the bonnet, it’s not ideal. With this tiny device that’s all a thing of the past, you can rescue anybody with something no bigger than a smartphone! 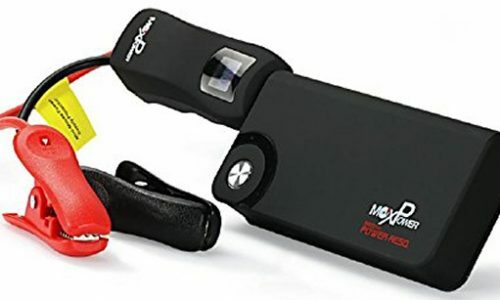 Considering the continuous restart power, and the useful additional functions, it is no surprise that we found this jump starter in the #1 spot in at least one Amazon car category. The Powerall is a similar size with similar functions, but no digital readout. I use it to charge my Galaxy Note 4, almost get three full charges . I was able to charge my iPad two times fully. Just received this charger in the mail today. Very light in the case and when I.opened the case, every piece was tightly packed in foam pockets that keep everything safe and secured. When I plugged it in, the display showed 50. So assuming it was 50% charged, I left it plugged in for about an hour or so. When I checked, the display now read 100. The instructions had nothing specific on how to charge unit or what the display should read when done. So hoping my common sense is correct, I think I’m ready to help somebody, anybody (! ), jump start their car. There’s been a couple of times when at a gas station or parking lot, that I’ve been asked to help “jumpstart” a car. Unfortunately, I’ve had to decline, as I was worried about damaging my car’s computer system. Now I can help anyone needing a jump and that really makes me happy! Yeh same here, I used to hate getting asked for a jump start, messing around with cables under the bonnet, sparking all over the place – it’s a piece of cake with one of these tiny starters though!